Anthony M. Ludovici’s grandfather and father, Albert Ludovici, Sr. and Albert Ludovici, Jr. were celebrated and successful painters in England. Anthony Ludovici was also a talented illustrator and painter, but he chose the career of a writer, devoting a considerable amount of his work to art criticism. What follows is an excerpt from Confessions of an Anti-Feminist: The Autobiography of Anthony M. Ludovici, ed. John V. Day, ch. 8, “My Life Work.” Unless otherwise indicated, all notes are by Ludovici. John V. Day’s notes are marked JVD. In discussing art, I wrote as one who from his earliest childhood had listened to the talk of painters, sculptors, and gravers in their studios, and at the age of twenty-five was beginning to feel deeply shocked by the anarchy that prevailed in these circles. No canon decided the value of a work of art. No authority, no tribunal existed before which a young aspiring artist could take his ‘masterpiece,’ in the sense of the old craft gilds, just as a doctor can take his thesis to those of his seniors who are in a position to grant him his doctorate. On the contrary, everything was at sixes and sevens. No two artists agreed on any principle of artis­tic production. All was chaos and uncertainty. I could think of nothing more discouraging to a young artist than the state of darkness and confusion that prevailed. The critics were bad enough, for, as Professor C. M. Joad truly observed, ‘Art criticism is a battle of ipse-dixitisms.’ But among artists themselves there was even less clarity and definition. Destitute of stan­dards and of any criteria for assessing the value of their work, their chance of popular acclaim depended on their own self-advertising efforts and their capacity for gaining enough journalistic support to herd a sufficiently impressive number of fans into their fold, all bleat­ing their name. When, therefore, I began to study aesthetics and tried to discover principles which, even if they fell short of a canon, would at least lend a certain consistency to my judgements, I naturally disregarded all contemporary art criticisms, especially those of the leading critics in the Times, the Telegraph, the Morning Post and the Standard, the weeklies and the foremost Parisian journals, as quite useless, and tried to frame out of all I had heard at home, at Rodin’s and in the studios of friends a sound basis for aesthetic judgements. Above, all, what I was most eager to combat and refute, because it struck me as wholly perverse, was the teaching of James McNeill Whistler, whom I had known ever since I was a child, to whose conver­sation I often listened, and who repelled both my mother and me as a man, and me in particular as a teacher. Early in my acquaintance with him I had grown doubtful about his integrity, and suspected that his art principles were prompted to a great extent by his own deficiencies. Even more significant, in my view, was the striking similarity between his sophistries and those to be found in a certain famous philosophical treatise, which I felt sure he knew nothing about and which, when I first read it, seemed to me thoroughly specious. Even those who first wisely resisted the initial steps of the move­ment that has culminated in all the extravagances, abuses and charla­tanry of our latest forms of art appear to have been unaware of the philosophical doctrines to which all ultra-modern artists might appeal for a vindication of their practices. In view of his intellectual gifts, Ruskin would certainly have been able to fight with greater authority and success the precursors of the latest school of so-called painters, if only he had known the philosophi­cal treatise which, when he was at his zenith, was already one hundred years old. For, in spite of the genius of its author and the intimidating grandeur of his achievements, Ruskin might well have detected the flaws in the great German’s aesthetic theories and forestalled by three or four generations the need of demonstrating their heretical character. But neither Ruskin himself, nor any one of his sympathizers or opponents seems to have had any knowledge of the Teutonic arsenal of revolutionary aesthetic doctrine from which, at any time after 1790, the secessionists from the Academy and the Beaux Arts might have drawn their munitions of war. 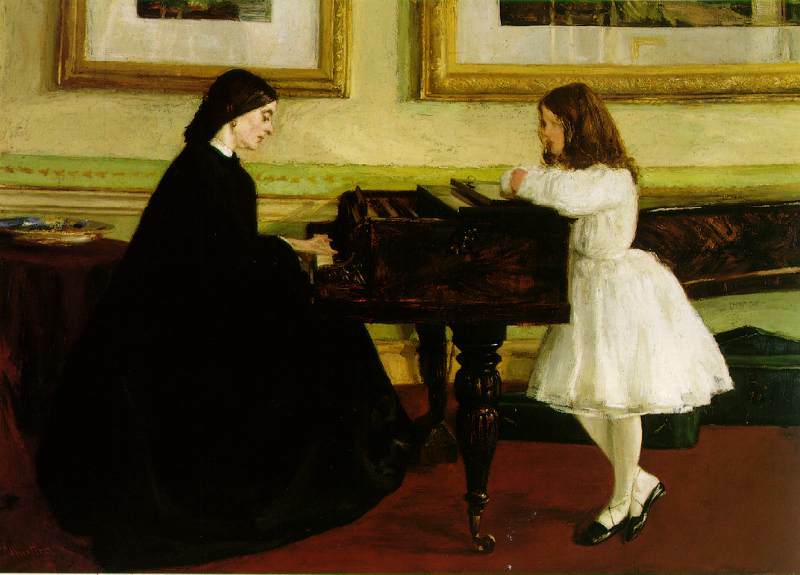 Thus, when Manet and Whistler propounded the fundamental principles which in the remote future were to bear fruit in the form of ‘abstract art,’ no-one had any inkling of the aesthetic war that lay ahead, or of the formidable artillery of German manufacture that might have been used by the innovators for their assault and by their adversaries for spiking the opposing guns. Passing over Manet’s contribution to the secessionist credo of the middle of the last century as neither as pernicious as Whistler’s, nor as strangely identical with those of the famous German thinker, it will suf­fice for my present purpose to show the extraordinary agreement of these two men—one an American painter, and the other a Teutonic thinker who had probably never held either a palette or a paintbrush in his hand—and to reveal how much was missed by both sides in the aesthetic controversy which shook the art world of the late nineteenth century, and how much still appears to remain unknown to the moderns who continue to take sides in the conflict. Nor should I like it to be thought that in indicting Whistler, as I have always done, I had any wish to assail the teaching of the early French Impressionists, many of whose innovations and reforms were at once salutary and opportune. In his letter to The World he actually embarked on the dangerous undertaking, pregnant with mischief for the future of the graphic arts, of assimilating pictorial art to music. ‘As music is the poetry of sound,’ he said, ‘so is painting the poetry of sight, and the subject-matter has nothing to do with harmony of sound or color.’ Then, most recklessly for a graphic artist, he added: ‘The great musicians knew this. Beetho­ven and the rest wrote music—simply music, symphony in this key, concerto or sonata in that,’ the implication being that the painter also could completely fulfill his function by producing ‘simply’ harmonies, symphonies and arrangements—of course, in color. The breathtaking novelty and seductive plausibility of this idea concealed from Whistler’s ill-informed and standardless public its utter speciousness. Because the graphic artist has a task so different from the musician’s that what the great musicians knew and practiced can have no relevance whatsoever for him. The graphic artist, on the other hand, by tradition, almost by defini­tion and by the nature of his function, has always been engaged in works of a representative character; had his attention turned to some corner of creation, and has always eschewed abstraction. The sparking-plug to the whole process which terminates in a work of pictorial art has always been an aspect of creation inspiring enough to induce him to perpetuate it for himself and others, and by his genial version of it to uplift us more than could our own unaided contemplation of it. But—and here is the whole crux of the matter—the essential factor in the graphic artist’s inspiration is the corner of creation which, by moving him to perform his skilled office, gives us that corner of life enhanced by the power of his genius. If, however, in emulation of the musician, he merely extemporizes in shades and tones and seeks only harmonies, compositions and arrangements, he insensibly descends to a more humble craft, an infe­rior aesthetic performance. Even if he does not wholly usurp, he certainly draws confusingly close to, the craft of the wallpaper, carpet or chintz designer. Now, the musician runs no such risk when he eschews a corner of creation as the basis of his expression. On the con­trary, by the very exigencies of his art his highest manner is the pro­duction of works which are exclusively harmonies, arrangements and variations of a subjective mood, unrelated to and not attempting to por­tray any particular corner of creation. His genius produces an abstract theme independent of life’s forms and in terms far from explicit, and our judgement concerning whether his work is well or indifferently done bears no relation to its representational character. His art is thus de rigueur ‘abstract art.’ He steps up by doing what the graphic artist steps down to do. And when the graphic artist steps down in this way, we, as the recipients of his impression, are left with the standards proper only to the judgement of a tartan, a Fair Isle pattern or a patch­work quilt. This flat refutation of Whistler’s frivolous dismissal of the subject from the painter’s legitimate concern indicates how seriously we err when, like Whistler, we confuse the painter’s with the musician’s task. Certainly let the harmony of colors and the composition of a pic­ture be among the concerns of the artist. But to make them his princi­pal, let alone his only, concern is nonconformist bigotry with all the lower-middle-class narrowness that this implies. That way leads inevi­tably to all the flagrant abuses of modern abstract art and the charla­tanry that it promotes and even suggests. It opens the ranks of graphic artists to every house-painter who may have the effrontery to display his subjective splashes of paint as a masterpiece. And the fact that the Royal Academy, in ultimate submission to the aesthetically illiterate clamor of the press and certain sections of the public, should at last have bowed its head before this anarchical teaching, and opened its doors to the hawkers of this spurious form of art, is but one proof the more of the derelict condition of the art world. No greater trahison des clercs has ever occurred in the history of culture than the support given by most of the leading national newspapers, including above all the Times, to those so-called artists who have desecrated their calling and sometimes made great fortunes by so doing. I am not forgetting the nefarious role played by the speculative picture-dealers of the period, especially in Paris, who, after investing relatively small sums in the early products of these abstract painters, created an artificial fame for them in order to reap handsome profits on their purchases. As for the public, all those who are inclined to be haunted by the dread of appearing reactionary or behind the times, or prefer being robbed to being suspected of defective connoisseurship, hastily swallowed the bait held out to them by those whom they imag­ined authorities, and the consequence was that a wholly factitious vogue was created for what we may hope will be regarded merely as so much junk in a hundred years’ time. In the Summer Exhibition of, I believe, the year 1961, I saw on the line at Burlington House a huge picture purporting to represent the advent of spring. It consisted merely of parallel lines of yellow, green and purple rectangles running from the top to the bottom of the canvas, the execution of which was well within the powers of any junior schoolboy, let alone of any house-painter, and as I examined it I could not help for the thousandth time deploring Whistler’s baneful influence and his impudent assumption of authority in art matters. Unfortunately, he lived in an age when to be much talked about was to be accepted as an authority on anything. The crowd and the national press, confusing mere notoriety with omniscience, could not doubt that one who enjoyed so much publicity must be an expert in every branch of knowledge. Although, as we see, Kant confines his remarks to the judgement and not the production of a work of art, his insistence on the view that the beautiful is the object of entirely disinterested pleasure, and that the subject has no importance in this respect, can at once be seen as having closer affinities with the appreciation of music than with that of any picture or sculpture. For, essential to the judgement whether the graphic artist has competently fulfilled his function, and displayed any genius in perpetuating for us a corner of creation, is not only the subject he represents, but also our gladness at having it perpetuated for us in terms transcending our own unaided contemplation of it. Indeed, the deeper our interest in the particular corner of creation represented, the greater will be our pleasure at seeing its beauties enhanced by his inspired vision of it. When, therefore, Kant argues that ‘in painting and in all the plastic and graphic arts—in architecture and gardening—in so far as they are beautiful arts, the design is the essential factor,’ and adds, ‘and here it is not what pleases our sensibilities, but what gives pleasure through its form that is essential for taste,’ the likeness to Whistler is more than ever pronounced, for the passage might be a paraphrase of Whistler’s insistence on composition, arrangement and color scheme as the fun­damental, if not the only, concern of the artist. Two pages earlier, Kant states even more explicitly a principle which, had it been lifted and used by Whistler, would have caused no surprise. Indeed, it is difficult to read this part of Kant’s Kritik der Urteilskraft without being constantly reminded of the Ten O’Clock and, above all, of Whistler’s practical application of his own doctrines in some of the pictures he painted. The justification which Kant’s aesthetic principles proffer by antici­pation to the worst excesses of modern art remained concealed for close on a century, and it was left to Whistler, who, as far as I am aware, knew nothing about them, to give them independent expression and thus to start the artistic trend that has culminated in abstract art. For this act of corruption it is to be hoped that an enlightened posterity will not forgive him. But such is the hypnotic influence exercised by fame alone, irrespective of merit, that it is doubtful whether the art world’s emancipation from the thraldom of his dogmas is likely to occur before many generations have passed on. For at the present time abstract art has become a vested interest. Millions of pounds have been invested in the hardly sane products of the school, and the museums and public and private galleries that have become its dupes are hardly likely to acknowledge their error. There remains one interesting question. Assuming that Whistler knew nothing of Kant’s Kritik der Urteilskraft, what affinity between the two men could possibly have led them independently to propound much the same aesthetic heresies? Strange to say, they were in one important respect related. For whereas Whistler, through his mother, could trace his ancestry to the McNeills of Skye, Immanuel Kant was the grandson of an immigrant from the north of Scotland whose name was Cant. So that it may well be that their common provenance bore some relation to the similarity of their teaching. When we consider the couple’s insistence on the design, the compo­sition, the arrangement of a graphic artwork, their denial of the interest of the subject, and their common tendency to luxuriate in greys, half-tones, blacks and sombre shades, it is difficult not to recognize their common negativity, their readiness to turn away from the world of the flesh, to regard the ‘corners of creation’ as more or less negligible. And here perhaps we light at least on one of their major temperamental affinities—the unconscious negativism deriving from their ascetic Scottish ancestry. Be this as it may, my work as an art critic and as a writer on aes­thetics was directed from the start chiefly by my pronounced aversion from Whistler’s teaching—an attitude that naturally made me unpopu­lar. For even if I feel constrained to acknowledge that in some of his best works he departed sufficiently from his own doctrines to produce paintings whose quality accounts for Moore’s lamentation quoted above, his blagues have caused too much havoc for his memory to remain wholly unsullied. Return to Philosophy, 1935, Chapter 5. ‘Dogmatic pronouncements.’—JVD. ‘A part of creation . . . seen through a temperament’—JVD. Music: Classical, Romantic and Modern, 1927, Chapter 1. Why Exhibit Works of Art?, Chapter 1. Educating for Democracy, edited by J. T. Cohen and R. M. W. Travers, 1939, Chapter 13. Joseph Hone, The Life of George Moore, 1936, Chapter 3. ‘He’d be better off painting and leaving the jokes to Oscar Wilde & Co.’—JVD. Critique of the Power of Judgement—JVD. The italics are mine; the German reads: ‘In der Malerei, Bildhauerkunst, ja, in allen bildenden Künsten—in der Baukunst, Gartenkunst—sofern die schöne Künste sind,’ etc. For Kant’s claim that color adds nothing to the beauty of the form but rather distracts the mind from it, see Part I, Division I, Paragraph 14 of the Kritik.